If you’re looking for a 1911 leather holster for your gun, you’ve come to the right place. My personal pick is the Don’t Tread on Me Premium Leather Ambidextrous Belt Slide Holster. 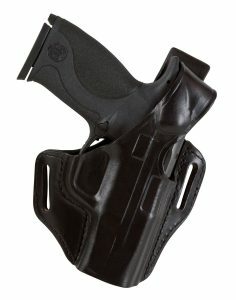 I chose this holster because it is made out of full grain leather that is thick. It’s the highest quality of leather the Don’t Tread on Me brand is known for. There is no synthetic materials used in its production. Another reason I chose this holster is that it can work on the inside or the outside of the belt giving you a couple of concealment options. It fits on belts that are up to 1.5” wide adding minimal bulk. A removable clip is for wearing on the inside, or you can carry it on the outside using your belt loops. It is ambidextrous allowing any shooter to use it. It fits many popular medium-sized and large gun including the Springfield XD, Glock 17, Ruger SR8, Ruger P95, and, of course, full size 1911’s. 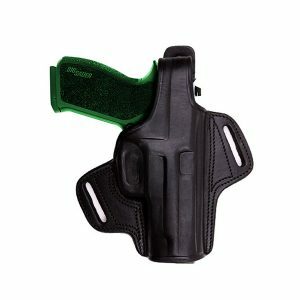 I wrote a buyer’s guide to help you choose the right holster for your gun. It includes information about holsters in general and explains the different types of holsters available. Hopefully, you gain some knowledge from it. A gun holster conveniently holds your firearm for easy access. They are usually concealed on the body leaving the hands free to access your gun in a moment easily. Several types of holsters are available to suit just about any gun owner’s needs. It helps to know more about them before you decide that it’s time to buy one. The make and model of gun you’re choosing a holster for dictates what kind of holster you can have. 1911’s have specific holsters that are meant to be used with them. With so many options to choose from for each gun available, you should consider what the purpose of the holster is, what size you will need, and how much the cost will effect your final decision. Why Buy A Leather Gun Holster for Your 1911? A gun holster for your 1911 will offer a comfortable and accessible place to keep your gun on your body. Purchasing a holster will free up your hands and leave the gun safe. They also help protect your gun from the weather on a rainy day, prolonging the life of the gun. A holster also can protect a gun owner from an accidental discharge. To determine the best type of gun holster, it’s important to decide what purposes are most important to you. Police officers choose a hip-carry holster for their pistol to make it easy to access during an emergency. Military personnel with larger guns rely on a shoulder holster supporting and protecting their weapon. Shoulder holsters are also popular for hunters that use larger rifles. You must decide what method is best for you when you want access to your weapon. 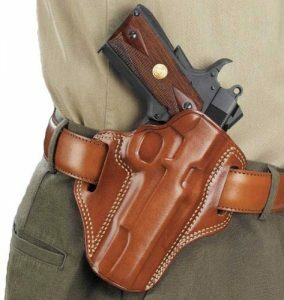 If you wish to have a gun that is easily accessible when you’re standing the best choice is likely a hip holster. If concealment is more important, choose a holster that hides under your clothing. If you will be sitting for long periods of time while you have your gun holstered, an ankle holster is probably the best solution. Here are five different types of gun holsters available and what they work best for. A hip holster is either attached to your belt or worn on a separate belt. The gun and holster can easily be concealed under a shirt that is untucked leaving it easily accessible. This type of holster distributes the weight of your gun unevenly at the waist which can affect your balance. A shoulder holster is worn across the body. Your gun’s weight is distributed very evenly with this type of holster, and it is great for a woman. The downside of a shoulder holster is that it is not as accessible as other types of holsters. A belly band holster is a wide elastic belt that has a holster built-in to it. This type is also easily concealed under an untucked shirt and can be accessed easily. They are worn very tight though which can cause some discomfort. An ankle holster is worn around the ankle and is commonly used to hold a backup weapon. These guns are concealed if you are wearing pants and are easy to reach from a sitting position. They tend to cause your gun to jolt against your body while you are running. A thigh holster is worn where the hand naturally hangs on your leg. 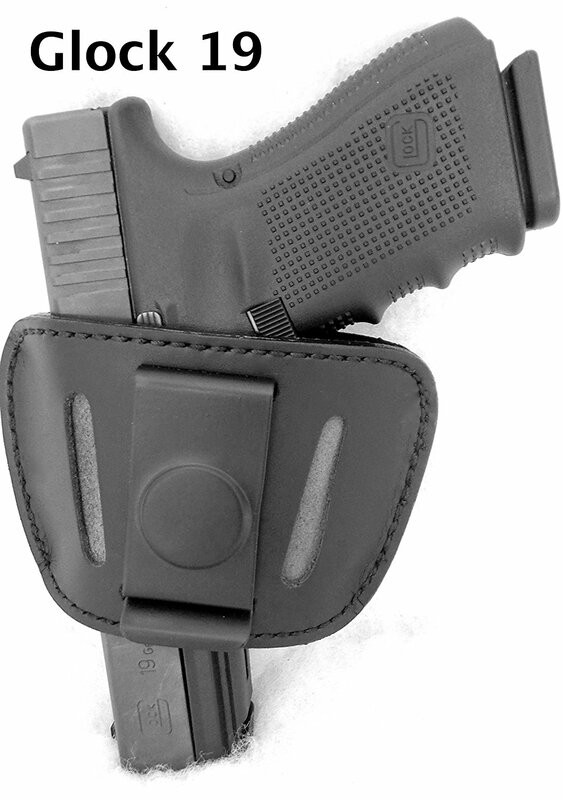 This type of holster is used most often when wearing other equipment as well. They don’t leave your weapon at easy access. Although gun holsters are also made out of nylon and Kydex, leather is still a great option when it comes to your guns holster. Leather holsters are comfortable and reliable. It’s the most common material that’s used in the production of holsters. Leather holsters offer attractive designs and if maintained properly will last you the lifetime of your gun. They can be custom designed how the user wants them. Leather easily scratches and squeaks when rubbed against. It can also be sensitive to moisture. Dyed leather holsters can bleed the color onto anything it comes in contact with. Your clothes may end up stained due to dyed leather. That’s enough information to get you started on your search. Here are four reviews of different leather holsters available for 1911s. Here are four other options that came in behind the Don’t Tread on Me Premium Leather Ambidextrous Belt Holster. The Relentless Tactical’s Ultimate Leather Gun Holster is an effective way to conceal your weapon with the most amount of comfort. This premium leather holster fits most styles of 1911 handguns that have any barrel length. These are handmade in the USA and are made from genuine US cowhide leather. The Galco Combat Master Belt Holster is used by law enforcement personnel, members of the military, and regular citizens. They are tested for quality and are made durable to hold your 1911 5” Colt, Kimber, Springfield, or Para handguns. This 100% leather product is made using the finest materials. 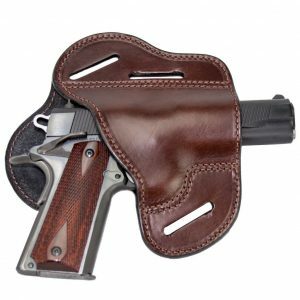 The Tagua Gunleather 1911 Hammer Down Belt Holster has a two-piece construction with backside body contouring and front molding. It’s lined with leather to help protect the finish of your gun. It’s molded for a more secure fit and uses double-stitching to increase durability. The Bianchi 56 Serpent Holster is made with premium grade leather that’s deeply molded on the front for good looks and comfort. There is a reinforced rectangular snap for additional security. The low-profile and hi-ride design offers exceptional concealment and very little bulk. My personal choice for the best leather holster for a 1911 is the Don’t Tread on me Premium Leather Ambidextrous Belt Slide Holster. The high-quality thick full grain leather that it’s made out of is better than the quality of the other options available. The ability to be used either on the inside or the outside of your pants give your more options for wearing and concealing. Most options don’t offer the ability to wear it more than one way. It’s ambidextrous allowing for use by anyone. Many of the gun holsters available are only to be used with one type of gun while the Don’t Tread on Me holster fits a wide variety of medium and large sized guns. This hip holster provides quick and easy access to your weapon, uses high-quality materials, and will help prolong the life of your sidearm. I think that this option fulfills everything that I am looking for in a gun holster. I chose this holster because it is made out of full grain leather that is thick. It's the highest quality of leather the Don't Tread on Me brand is known for. There is no synthetic materials used in its production. I hope that this buyer’s guide was informative and helped you figure out what you are looking for in a gun holster. Maybe you found something that fits your needs in the reviews I provided. Enjoy your search for the best leather holster for a 1911.